GNB2018 award program aims at rewarding and encouraging the researchers presenting the best scientific contributions in the conference. It is not exhaustive and will be updated continuously. Please be aware of the requirements for each award category. A general requirement is that it is possible to apply for the award to one and only one category only. Drive your technology to the patient through the market! Do you want to know whether your “invention” (i.e. device, new technology, software, new solution) can be patented? Do you have a research result that may become a product? Do you wish companies to evaluate your technology or do you want to set up a new start up? Apply to the Award “Switch 2 Product – GNB 2018 – Innovation in Bioengineering”! Submit an abstract by email to info.tto@polimi.it before May 13, 2018 at 23.59 (CET), describing your idea, the technology, the advantages with respect to the state of the art and the possible exploitation strategies. Here you can find the Template and the Guidelines. Please, note that your proposal must be new and inventive to apply to this award: this means that it cannot be already patented or published o disclosed to the public before GNB2018. Read the S2P Award Guidelines for the instructions. “Your idea in a Tweet and an image”: The best 10 proposals will be selected by an Innovation Expert Committee composed by Technology Transfer Managers from the Technology Transfer Office di Politecnico di Milano, startup experts from PoliHub, the incubator of Politecnico di Milano, and will be allowed to present their idea to the GNB 2018 conference with a format that will keep the confidentiality. 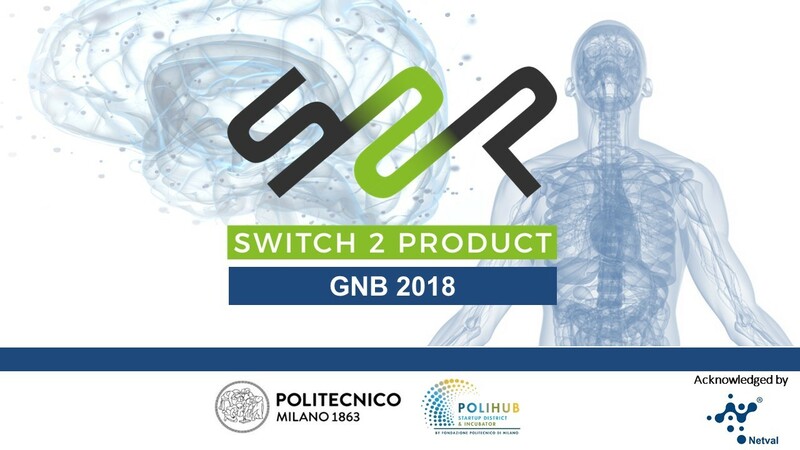 S2P Innovation Corner: during GNB2018, the 10 selected applications will be admitted to a private meeting of 15 minutes with the Innovation Experts of the Committee and Patent Attorneys, Investors and expert from Companies in the biomedical field. This Committee will work, under non confidential agreements to protect the novelty of your proposal, to select the 3 winners. 1 Acceleration Program at PoliHub: selected Mentors and Expert of IP, start up and management will help you to define the best strategy to exploit your technology and bring it to the market. Netval, the Italian association for the Valorisation of Results from Public Research, gives its official recognition to this Award. The six papers, which will be evaluated as the best for each track, will receive a prize (1.200 €). Candidates must be 35 or younger on June 25th 2018 and must be both the first author and the presenter of the winning paper. Age correction applies (*). Deadline for submission of candidatures is same as for the abstract. Select the appropriate track. When submitting a paper check the box “eligibility for track award”. Linkverse S.r.l., is a company providing cutting edge services for biomedical imaging. They sponsor the “Primaga 2018” prize for Computer Vision in the frame of the GNB 2018 congress. The prize (1.500 €) is intended to award the best work on Artificial Intelligence applied to the analysis of images and videos. Candidates must be 35 or younger on June 25th 2018 and must be both the first author and presenter of the winning paper. Age correction applies (*). Deadline for submission is same as for the abstract. When submitting the paper (in any track) check the box “eligibility for Primaga award”. for maternity the maximum age is incremented by 18 months or, if longer, by the documented amount of leave actually taken for each child. For paternity, it is incremented by the documented amount of paternity leave actually taken for each child. For long-term illness, clinical training or national service it will be increased by the documented amount of leave actually taken by the participant. If you have any comments or questions, please contact: alessandra.pedrocchi@polimi.it.